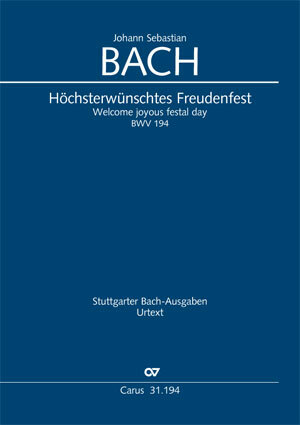 The cantata "Höchsterwünschtes Freudenfest" BWV 194 was composed for an organ dedication on 2 November 1723 in Störmthal, Saxony. A year later, and with just a few alterations, the cantata was performed again in Leipzig on Trinity Sunday. Our edition takes this Leipzig version of 1724 as its source. The special occasion of its composition is reflected in the extent of the composition which has twelve, instead of the usual six, movements. The orchestral scoring is for strings and three obbligato oboes. A special feature of the cantata is its structure as an orchestral suite. The beginning is a spirited opening chorus in the style of a French overture. The bass aria in the third movement has the character of a pastorale, and the following aria (movement 5) in turn has the character of a gavotte, etc. A simple four-part chorale concludes this multifaceted composition, marked by some extremely heartfelt moments.